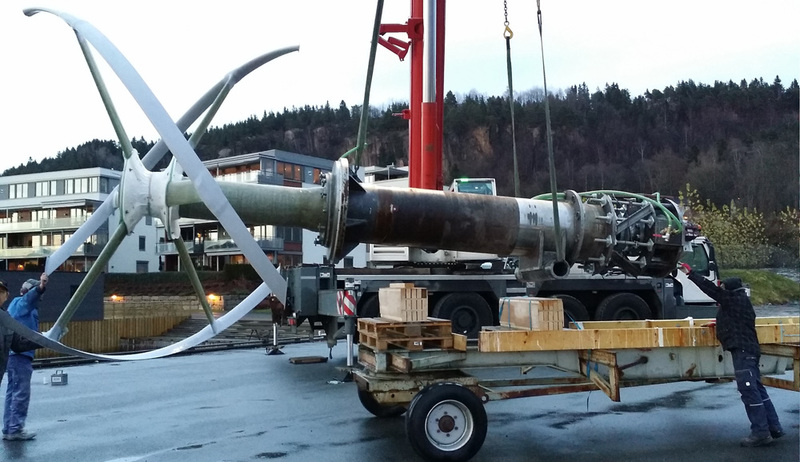 Vesconite Bearings is proud to be associated with tidal energy equipment developer Norwegian Ocean Power, which has successfully trialled its Pulsus horizontal-axis spiral-design tidal turbine, as part of the development of its first commercial unit. The turbines were tested in Drammensfjorden, Norway, where a dynamic test on the composite structure and bearings was performed. The structure bends and flexes with tidal currents, which can produce significant turbulence and considerable upward and sideward forces, so the testing of uneven forces is a key part of testing for this tidal-turbine. “We were hoping to separate out any vibration from the structure,” informs technical director and founder Kent Thoresen, noting that the company’s turbine was successful in this aim. The thrust bearings moved backwards and forwards and eliminated the vibration as planned, that might have otherwise lead to a systemic failure. The 0,5m-diameter Vesconite bearings, meanwhile, which were installed on each end of the horizontal unit, also performed well in their ability to absorb vibration. They were chosen after the testing of various competing products that were less flexible and exhibited dry-run problems. They are also shown to exhibit no swell in water; require no grease, oil or additional lubrication; and have a load capacity that is unaffected by water. “There are many failed projects in the tidal energy industry due to turbulence that causes vibration and uneven force distribution,” comments Thoresen. “That is why it was important to fully test our unit in real sea conditions,” he notes. Norwegian Ocean Power is the owner, financer and developer of the innovative turbine technology, which will be installed in the sea of Norway next year and begin commercial production of 1TWh of energy per year for use in Norway. The intention is to start production on several turbines in 2017 and 2018, with Canada and the UK being the most likely first markets for these turbines.